Hmmm... I never thought of doing this before. 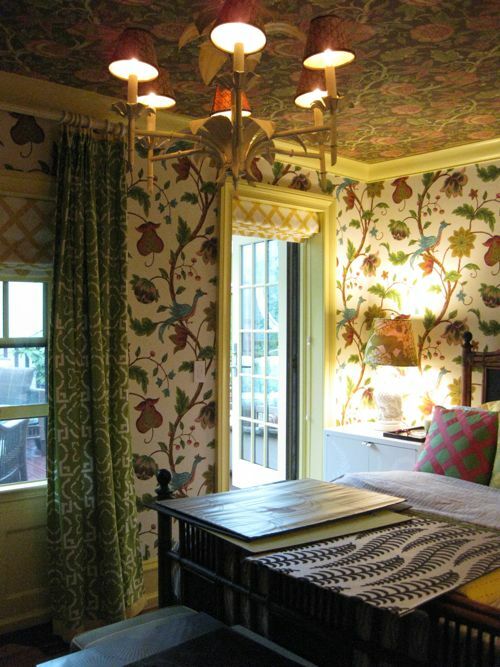 Wallpaper on the ceilings - yay or nay? Swoon...I love that second room! When given the choice, I always go bold, so yay for me! Where were you in the 70’s LOL. YES YES YES love it! Well, For me it's Yay!! !this is interesting and the contrasting paint on the ceilings,a wallpapered ceiling as well is to die for. I love everything about the room!thanks for sharing.Nice Post! Yay!!! 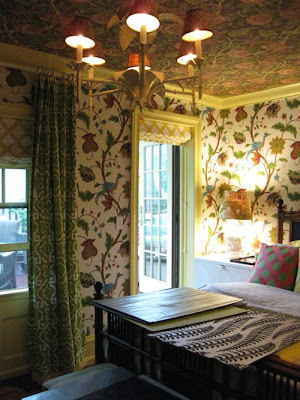 I wanted to do this in the guest room of our new house with some William Morris honeysuckle wallpaper but because we were forced into putting sprinklers and smoke alarms (code) on every single ceiling in the house, I chose not to. I didn't want to draw any more attention than neccesary to them! I've always loved the look though...great pics! I like it in the second room. It reminds me of a chalet. The other rooms, not so much.